Hotel "Slavyansky" is located on the picturesque bank of the river. Desna in the immediate vicinity of the Savior-Transfiguration Monastery (XI-XII centuries.). Standard rooms, junior suites, suites and apartments are available. Each room is equipped with air conditioning, a safe, a TV and a private bathroom with 24-hour water supply. 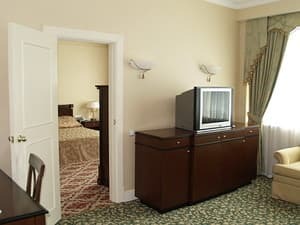 For the convenience of guests, all rooms include electronic locks, satellite TV and internet access. The conference hall of the hotel, with a capacity of up to 40 people, is equipped for conferences, business meetings, corporate and private events. 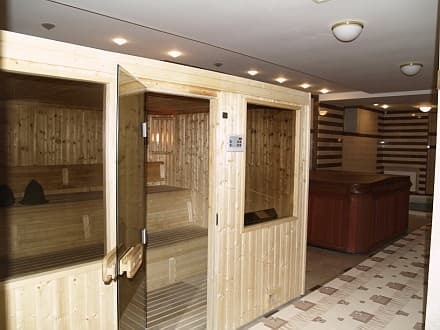 The clients can use the services of a hairdresser and a massage therapist in the beauty salon, visit the gym, a billiards club, or relax in a Turkish bath or a sauna with a swimming pool. 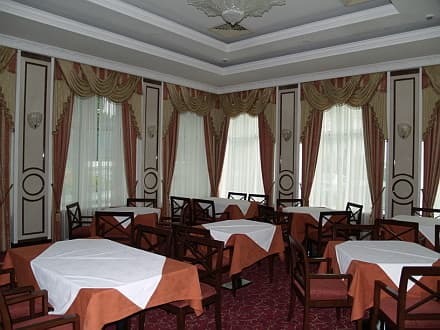 In the restaurant of the hotel "Slaviansky" guests can choose between European, Ukrainian and Russian cuisines. Guests of the hotel can use the delivery service to the room. The hotel is located 2 km from the bus station. 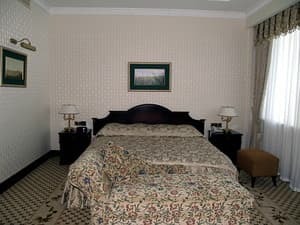 Description of the room: One room with an area of ​​26 sq.m. with two single beds 90 cm wide. Description of the room: One room with an area of ​​26 square meters. with a double bed 180 cm wide. 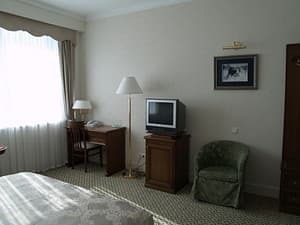 Description of the room: The room consists of two living rooms (living room and bedroom) and two bathrooms (washbasin, bathroom, toilet, bidet). 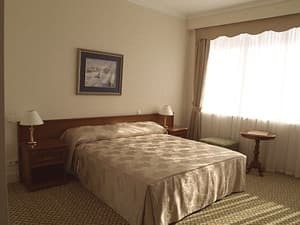 The maximum number of people staying in the room is 1-2 people. The total area of ​​the room is 41 sq.m. In the bedroom there is a double bed 180 cm wide, and in the living room there is a sofa and an armchair. 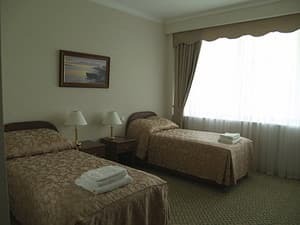 Description of the room: The room consists of two living rooms and two bathrooms (a wash basin, a bathroom, a toilet, a bidet). The maximum number of people staying in the room is 4 people. The area of ​​the rooms is from 44 sq.m to 52 sq.m. Each room has one double bed 180cm wide. Description of the room: The total area of ​​the room is 156 sq.m. The room consists of a bedroom, a living room and a study, a dining room, one full kitchen and one additional bathroom (washbasin, jacuzzi, shower, toilet, bidet). It is designed for one or two people. The width of the bed is 200cm. Чисто, удобные номера, впрочем у меня был номер категории выше средней. Хорошая кухня, но завтрак надо заказывать с вечера. Wifi отсутствует, то есть он есть, но только в метре от стойки регистрации. В 10 метрах в ресторане уже нет, в номерах тоже нет. Мне кажется даже в президентском люксе нет. Завтрак надо заказывать с вечера, собственно все лучше говорить и заказывать и заранее. Вода по расписанию с утра и вечером. Все очень понравилось, отличное расположение отеля. Шикарные условия, персонал хорошо справился со своей работой ! Всем доволен, всем рекомендую! Свято випускників цілу ніч до ранку, шумно. 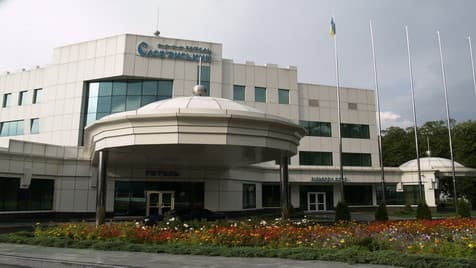 Дуже дорого, послуг нема ніяких, ресторан не працює, сніданкі відсутні,в 5 годин ранку будять дзвони монастиря,парковки нема є гараж на 2 авто, не рекомендую . Хороший просторный отель, в номере чисто, просторная ванная комната (что, лично для меня - отлично))) ), хорошее расположение (возле реки), парковка на территории, приятно видеть такой отель в небольшом городке. Provision of an extra bed - 215 UAH per day (a euro clamshell). 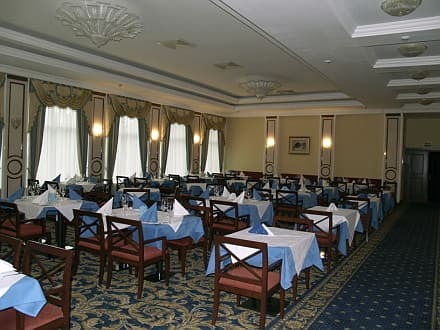 In the restaurant of the hotel "Slaviansky" guests can choose between European, Ukrainian and Russian cuisines. Guests of the hotel can use the delivery service to the room. Hotel "Slavyansky" is located on the picturesque bank of the river. Desna in the immediate vicinity of the Savior-Transfiguration Monastery (XI-XII centuries.). The hotel is located 2 km from the bus station.